From Red Cloud Comics comes the prologue to Sioux Cloud’s short indie drama thriller “Red Cloud: Deliverance.” Taking off from the short film’s original premise about an enigmatic man with a violent past who seeks peace in a rented room, this is the comic before his newest chapter. In case anyone who saw “Red Cloud: Deliverance” were wondering why the climax ended the way it did, this is the comic book that basically lays the ground work. Red Cloud was at one time a very vicious and swift warrior who spent most of his days working as an agent for a non-profit organization that infiltrated child trafficking rings across the world. The man we see in the short film “Red Cloud: Deliverance” is only but a shell of the man we see in the comic. 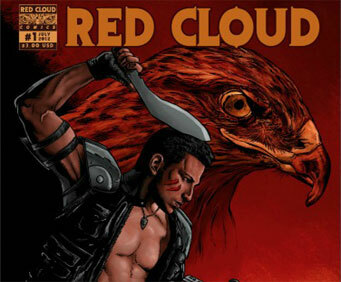 Written by Alex Kruz with pencils and inks by Nikkol Jelenic, “Red Cloud” is a fairly straight forward and interesting comic book telling the exploits of Jake Red Cloud as he uses his spirituality to guide him as a warrior through vicious crime rings and help guide little children to safety. The art work is really well done with concentration on Alex Kruz’s more defining features, and the entire story builds up to the climax which is supposed to also set the foundation for what happens to Jake Red Cloud. Very much in the vein of The Punisher, Red Cloud ends up murdering someone he simply shouldn’t have, and he pays for that crime. Sioux and Red Cloud Comics seem to want to transform Jake Red Cloud in to a multimedia hero for fans, thus there is the short comic book for the entertaining short film, and there’s even an ad for a Red Cloud action figure at the end of the comic book. Red Cloud seems like a character that can surely grant a lot of mileage. It’s now up to audiences to decide if he holds any weight in a world filled with superheroes and ruthless warriors that choke the comic book market. This entry was posted in Rot Your Brain and tagged Action, Drama, Prequel, Thriller. Bookmark the permalink.